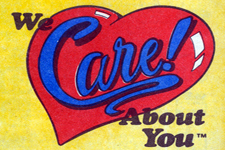 The tenth anniversary season of Great Adventure in 1984 started out to be very promising, continuing to build on the success of the previous year. Another major new ride was added with the state of the art Sarajevo Bobsled roller coaster opening in the spring. To celebrate, guests bringing snowballs were admitted for free. 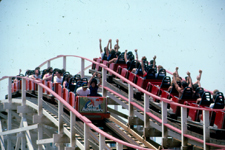 Celebrating the 100th anniversary of the roller coaster, one side of Rolling Thunder was operated with its trains reversed. 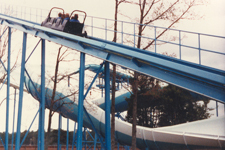 The new ride experience was billed as "Rednuht Gnillor" (Rolling Thunder backwards) and added a new thrill to the ride in its fifth season. 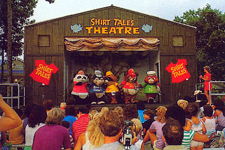 For the first full season, all of the Six Flags parks welcomed the addition of the Shirt Tales animated characters. 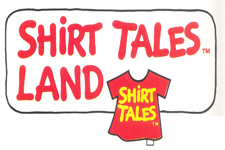 The Shirt Tales were a short-lived creation of the Hallmark Card Company with their own animated series on Saturday mornings, and the parks added walk around characters and re-themed their children's areas with Shirt Tales themed attractions. 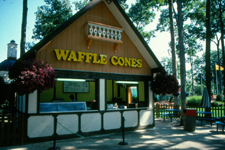 Kiddie Kingdom became Shirt Tales Land and all the existing attractions were renamed and new interactive experiences like ball crawls and climbing nets were added, bringing the area up to date with the trends in children attractions. On May 11th, everything would change at the park when a tragic fire destroyed the Haunted Castle resulting in the death of eight teenage guests. The fire, investigations, and legal actions which followed changed the entire theme park industry as fire safety regulations were beefed up nationwide in response. 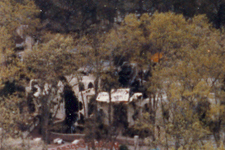 The fire was a black eye to the park, causing many guests to lose faith in the safety of Great Adventure and theme parks as a whole causing a 20% drop in attendance from the previous season. 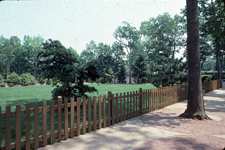 A major safety sweep far exceeding the required standards was done throughout the park insuring that an accident of this magnitude could never happen again.